Spatial planning is increasingly gaining renewed attention as an invaluable tool for addressing all kinds of socio-environmental issues. However what planning is and could be in contemporary society often differs from those forms of planning that classic readings on planning elaborate on. The Routledge Handbook of Planning Theory therefore presents a timely and very welcome new overview of both traditional and novel theories of planning. The handbook presents key contemporary themes in planning theory through the views of some of the most innovative thinkers in planning. They introduce and explore their own specialized areas of planning theory, to conceptualize their contemporary positions and to speculate how these positions are likely to evolve and change as new challenges emerge. The different contributions show the evolution of planning theory towards a broad and interdisciplinary field that addresses the various ways in which societies all over the world are planning and organizing their environment. It elaborates on the various strands of planning theory and it puts forward some novel perspectives on the policies and practices of planning. Planning is pivotal in dealing with the social and ecological consequences of ongoing urbanization and increasing demands for land and various natural resources. In the past decades, however, many countries have significantly weakened their planning system, while various others even lack basic planning institutions. As a consequence governing and directing land use activities and spatial developments has become a big challenge. The Handbook does not put forward any direct solution to this challenge, but the presented ideas, concepts and theories offer a solid basis to further rethink and rejuvenate spatial planning and adapt it to the complexity and diversity that characterize contemporary societies. 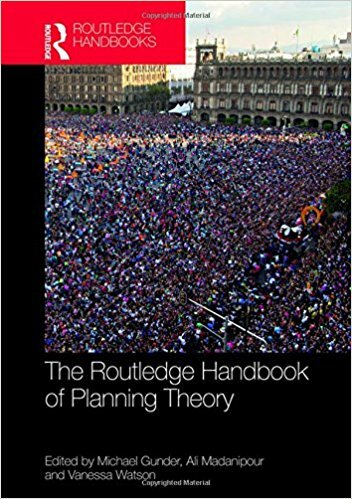 The Routledge Handbook of Planning is a valuable resource for anyone interested in planning and planning theory and a highly recommended reading for planning scholars and students all over the world.